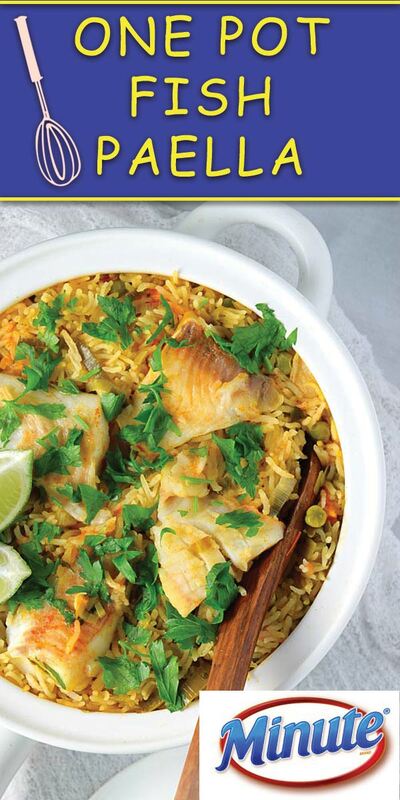 A simple One Pot Fish Paella (rice dish) cooked using Minute® Ready to Serve Rice from start to finish in one pot! 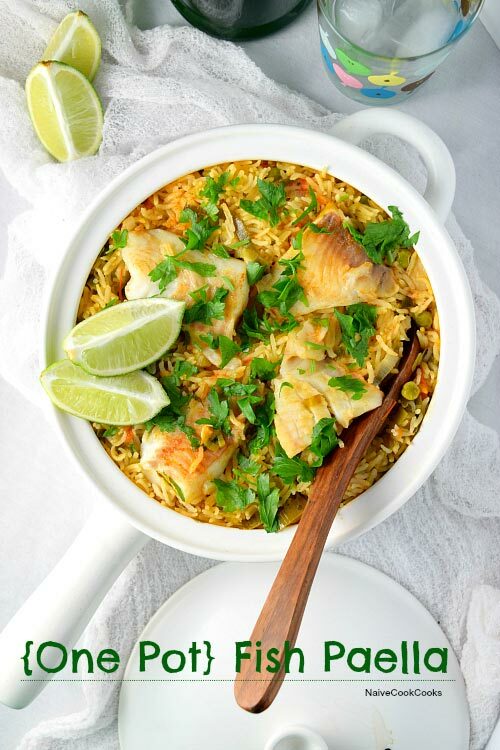 Healthy, filling and light, this dish is a perfect weeknight meal for the whole family! Well my fascination with fish continues. People who know me well, know how much I love rice. Rice in any form is my absolute favorite meal to eat. There are days when I am alone at home and if I find some leftover rice in the fridge, I can totally make a meal out of it. Like few days back, adding some kale and eggs and cooking it all together in some oil created a wonderful filling meal in just few minutes. See what I am talking about! Rice is the best. And since I found this easy cooked rice all ready to go, my love for rice has been increased thousand times. The best part being that these are totally portable. Just take one cup anywhere and all you need is 60 seconds and a microwave to heat them up! I feel they are especially great for office lunches! 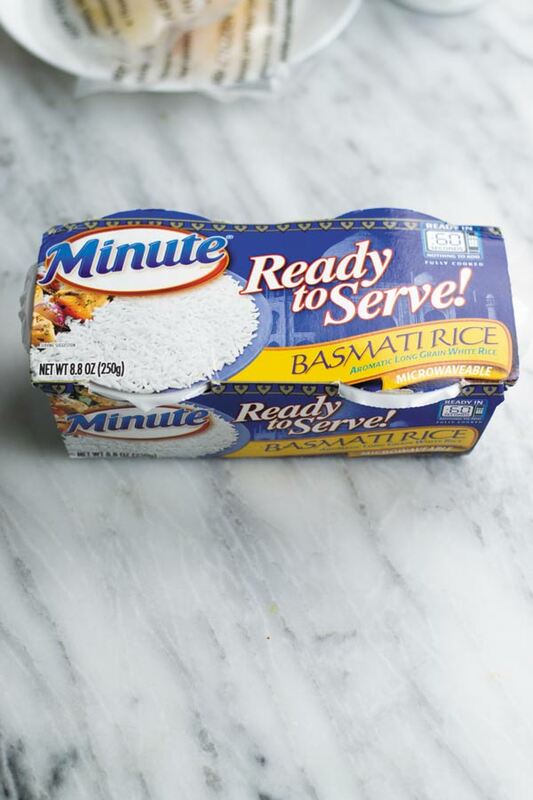 There have been times when waiting for the rice to cook has felt painstakingly long and now thanks to Minute® Ready to Serve Rice I get to eat rice in a moment’s notice! They have lots of fun flavors some which can be eaten just on their own! I had some other recipe planned for you today but since yesterday I am having recipe disasters! I have been working on this salad recipe and still it’s far from being perfect. So I started working on this rice dish and it came out amazing in my first try. Paella is basically a rice dish with vegetables and usually some sort of meat all cooked together in a pot. Paella to me reminds of Indian rice dish called “Pulao” which is nothing but rice with vegetables and some sort of meat though meat is totally optional and so is it in paella.You can use normal basmati rice or if possible find these amazing individually portioned Minute® Ready to Serve Rice as I used 4 packets here and knew exactly well that it’s perfect for 4 servings! See you don’t overeat that way! The technique is somewhat different and so are the spices used but both are equally delicious. I always wanted to try paella when in restaurants but always they had some sort of meat which I wasn’t comfortable eating. But few years ago, we tried this Spanish restaurant in Chicago and they had paella with chicken and as you might have guessed, I just had to get it. And it’s funny cause even though I enjoyed it so much, I never thought of making it at home. But now with my ongoing fish obsession, I just had to make paella. 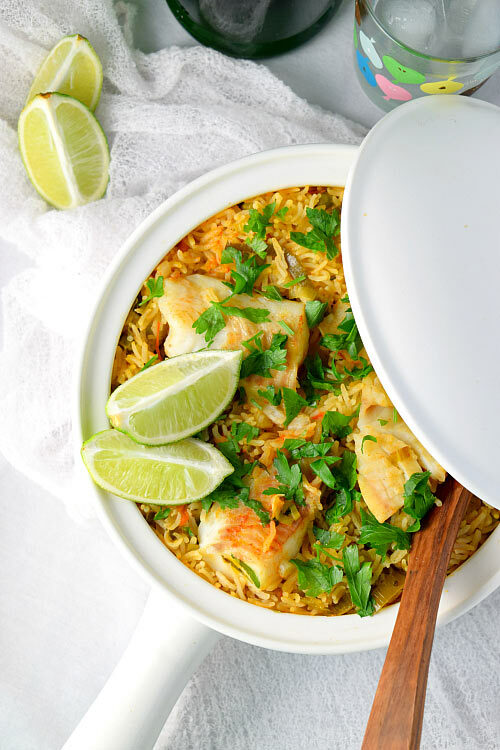 This one pot Seafood Paella gets all done in just ONE POT (oh yes!). Yes, less dish washing and half gets cooked on the stove and the rest gets done in the oven while you are setting your table and doing other chores before dinner which you probably shouldn’t be doing ( as in my case those chores like painting my nails, getting hooked up on watching my favorite show have led to burning of uncountable dinners! Oops). 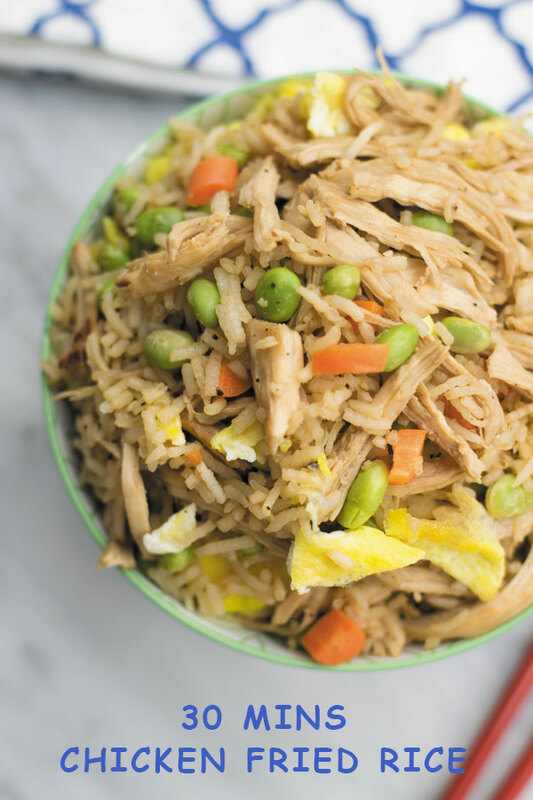 It’s an easy weeknight or even weekend meal option and is packed with flavors. You can throw in whatever veggies you have on hand and whatever meat you feel like. 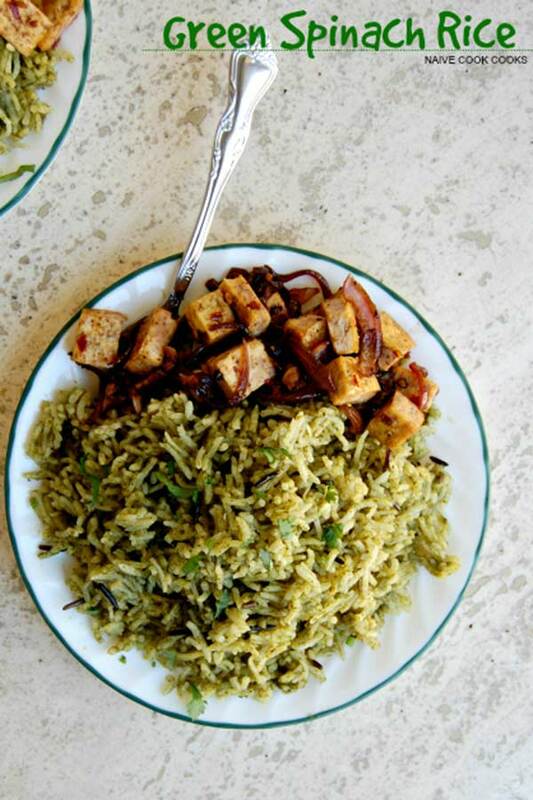 You can even make it vegetarian and substitute meat with paneer (Indian cheese) or tofu. 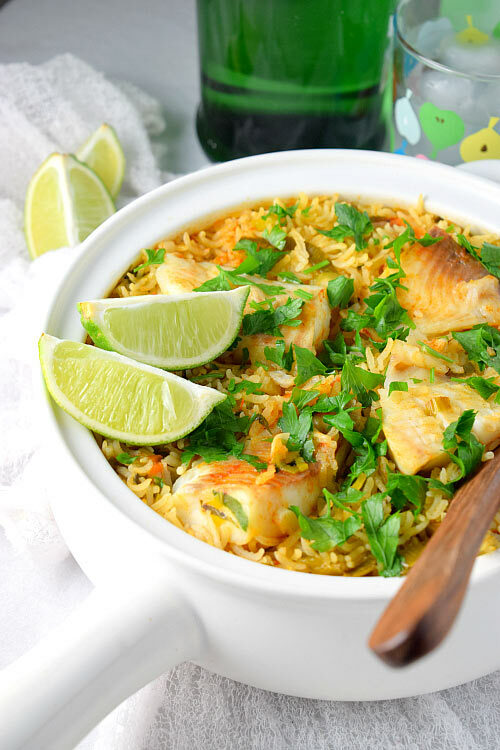 This delicious and light Paella (rice dish) with fish gets cooked in one pot from start till the end! In a pot, add butter and oil and melt. To it add chopped garlic and half of the leeks along with a pinch of salt. Saute on medium-low heat for few minutes. Add green peas, tomato and stir around. Cook for few minutes. Add rice, 2.5 cups of water in case of plain basmati rice or 1 cup water in case of Minute Ready Basmati Rice, saffron, salt, black pepper, lemon/lime juice, paprika and half of fresh parsley. Stir it all around and taste. Add little extra salt as by the time it cooks, water will absorb some of it salt flavor. Cover and cook on medium-high for good 15 minutes in case of normal rice and only 5 minutes in case of Minute Ready Rice.Keep an eye. If it starts to dry out, add more water and stir. Now clean the fish and chop in desired size. 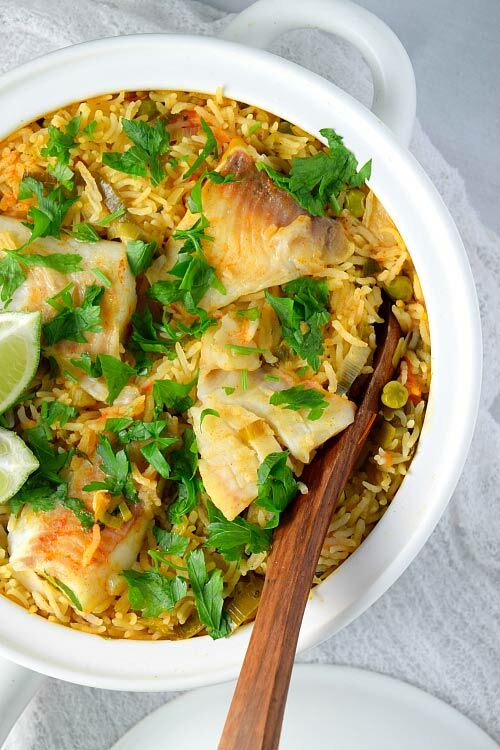 Rub salt and paprika on both sides of the fish and lay the fish pieces in the pot on top of the half cooked rice. Cover and transfer the pot to the pre heated oven and cook for 8 minutes. 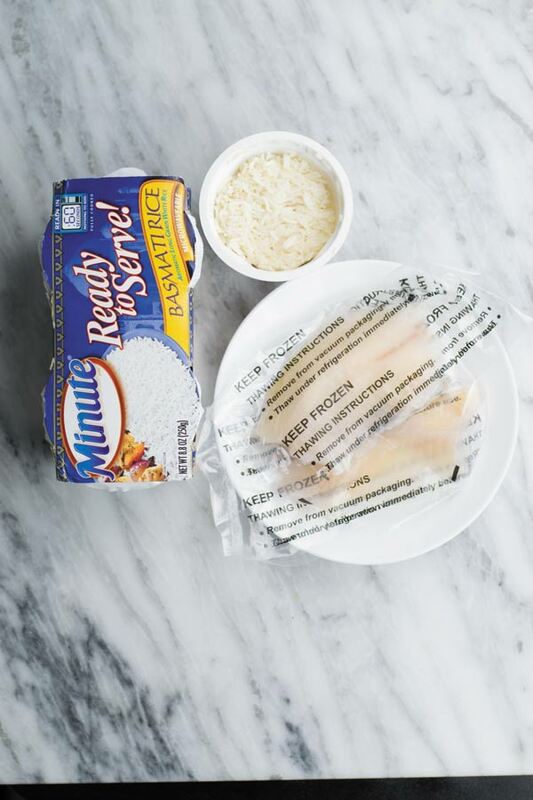 Flip the fish and continue cooking for another 7-9 minutes until fully cooked through. Garnish with remaining parsley and more lemon or lime juice. I usually like making it in <g class="gr_ gr_117 gr-alert gr_gramm gr_run_anim Grammar only-ins doubleReplace replaceWithoutSep" id="117" data-gr-id="117">big</g> batch and keeping it in an airtight container in the refrigerator to eat for busy weeknights. Just warm up in the microwave and it's ready to eat. my goodness what a gorgeous dish! I love your photos. I also love paella. It reminds me of being on holiday in Spain. Holiday in Spain?!! Now I am dreaming about it too!! You must try it then Gayle!! Do report back! Hehe thanks Kelly!! It’s seriously super easy! Try it! This looks amazing! I love the simplicity of using only fish. I absolutely adore paella and have had it on my to do list for way too long. You have inspired me! Thanks Rachelle! Yeah I have seen it with lots of different meats in one but I thought keeping it simple with just fish will make it easier to cook and easier to enjoy too! 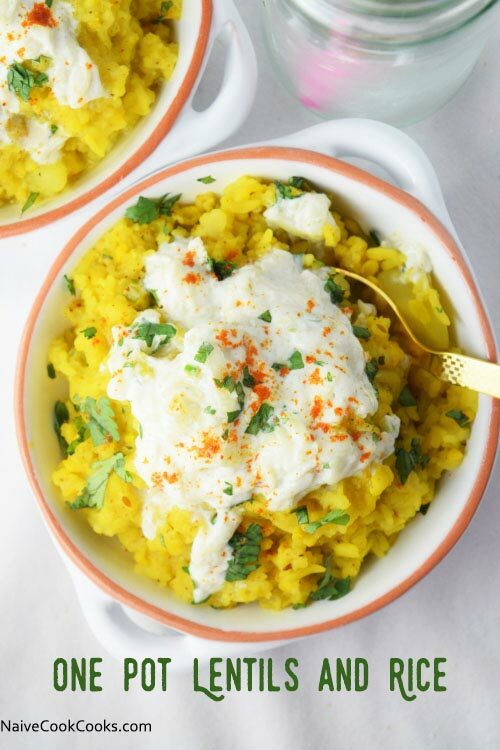 This is so flavourful and tasty! I love that spinach rice too. What a great post. I’ve never had paella cause it usually has sea food and I don’t eat sea food. I will def try your version – which chicken – in the near future! Thank you! Chicken will taste amazing here Olivia! I have to make this dish for my husband! He will love its perfect combination of flavors which include seafood! Thanks Annie. Hope your husband enjoys this! Thanks Christina and then you must try!! I love paella! Even though fish is already good, I also love your use of leeks, and peas. Pictures looks mouthwatering, Ami! A must try! This paella looks fantastic! Love the fish in it and that it’s in one pot. I’ve never made paella either, I think I’m going to have to. Especially if it involves fish! Less dishes the better, my mom would love this dish! On the for dinner list!